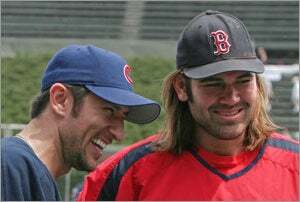 Were it not for Johnny Damon, people in New England might still be wondering whether the trade of Babe Ruth really did put a curse on their beloved Red Sox. But Damon hit two home runs and drove in six runs — six! — in Game 7 of the ALCS against the dreaded Yankees in 2004 and you know what happened after that. Damon was the face of that team, the coolest guy on the planet for a few months. That all ended when he signed with the Yankees before the 2006 season. The Red Sox offered Damon less money than did the Yankees and he choose the better deal. It was a business decision for both sides. When Damon came back to Fenway Park in 2006 for the first time, he was booed and cursed. To varying degrees, it went on for all four seasons he spent in pinstripes. Damon didn’t much like it, but he always said he understood it because of the team he decided to join. That Damon played a huge role in helping the Yankees win the Series last year only added to the hatred some Red Sox fans had for him. Damon returns to Fenway Park on Friday night, now as a member of the Detroit Tigers. How about a standing ovation this time? Just once, when he comes up the first time. Stand up and cheer him. Let him tip his cap and smile and then everybody can get back to the game. Bemoan the modern athlete and excessive salaries all you like, but Damon didn’t invent free agency, he only took advantage of it. We all look for the best deal we can regardless of what we make or what we do. I was happy at my old newspaper but when the Globe offered me a better deal, I took it. Unless you’ve had the same job all your life and never once asked for a raise, you can’t complain about what Johnny did. Beyond that, it’s fair to say that no player cared more or gave more than Johnny during his time with the Red Sox. He had a .295/.362/.441 line in his four years and scored 461 runs. He averaged 150 games a year and in the 2003 playoffs played with a concussion that would have had most people in the hospital. Damon grew the crazy long beard before the 2004 season because it hurt his face to shave, such were the after-effects of that concussion. Damon is a borderline Hall of Famer. He has 2,520 hits, 214 home runs, 381 steals, 97 triples, 477 doubles and 1,545 runs scored. You know how many players in history had 2,500 hits, 200 homers, 400 steals, 100 triples, 500 doubles and 1,500 runs scored? Just one, Paul Molitor. If Damon makes the Hall one day, it could be with a “B” on his cap, too. It’s fine to be mad at him for signing with the Yankees. But give the man his due. You forgave Roger Clemens, you can forgive Damon. Standing ovation. The man deserves it.